A $2.6 million expansion project is now underway at the Mt. Hope Convenience Center that will improve traffic flow, increase services and enhance safety at the site. 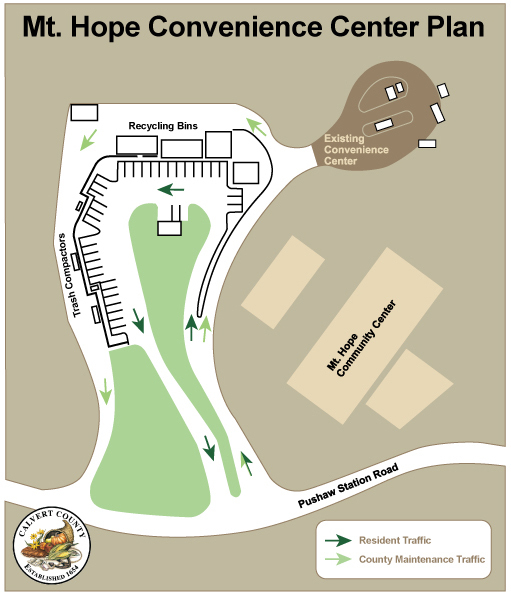 The 12-month project, overseen by the Calvert County Department of Public Works, will enlarge the center and include new traffic patterns allowing the exchange of full bins without disrupting convenience center users. The center remains at its 96 Pushaw Station Road location in Sunderland. New features at the center will include covered recycling areas and raised platforms adjacent to the bins affording easier access for offloading. The center will remain open throughout construction, though residents may experience periodic delays as work progresses. The salt dome at the site will be relocated to the area where the current convenience center stands. Construction work is continuing. The office building and retaining walls are under construction. The walls should be completed in the next few weeks and will define the site. It is anticipated that the new convenience center site will be completed by this this fall. The convenience center shall remain open with only minor interruptions in service due to construction.